Cessna 400 Series PowerPac Spoiler Kit From Spoilers Inc. Enjoy the added benefits with your spoiler equipped Cessna 400 Series airplane! When it’s time to come down you’ll be glad you have PowerPac Spoilers installed on your Cessna 400 series aircraft. With PowerPac Spoilers you command descent rates up to 3.5 times faster. Simply touch a button and PowerPac Spoilers instantly reduce lift and increase drag. Deploy your Cessna's PowerPac Spoilers at any speed up to Vne for rapid descent rates without the need for major power reductions. Avoid engine shock cooling and maintain cabin pressure. PowerPac Spoilers are doubly useful in sudden turbulence by reducing lift-induced loads carried by the wings. 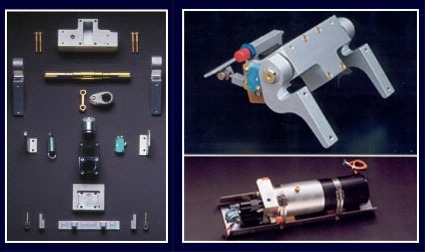 The Jet Type design provides maximum effect, no drag when retracted and lower installation cost. Plus you can deploy and retract PowerPac Spoilers in icing conditions. 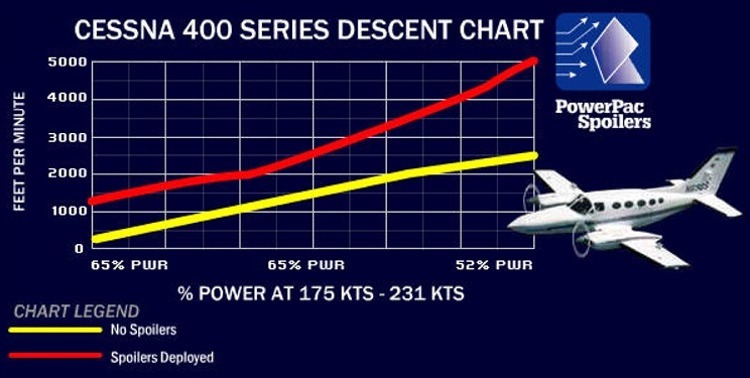 PowerPac Spoiler Performance Graph depicts actual flight test data obtained during required FAA certification flight tests of Spoilers equipped Cessna 400 Series aircraft. 402, 414, 421, 425. PowerPac airplane spoilers "Jet Type" design is similar to those used on commercial jet airliners. The system consists of single flat plates, 17.50" X 10.50" one on top of each wing that lies flat when not in use. When deployed, they extend upward into the slipstream at a 60-degree angle, thereby "spoiling" a portion of the lift being generated by the wing, while at the same time creating drag. PowerPac Spoilers are designed to work in conjunction with standard Cessna 400 Series aircraft parts. 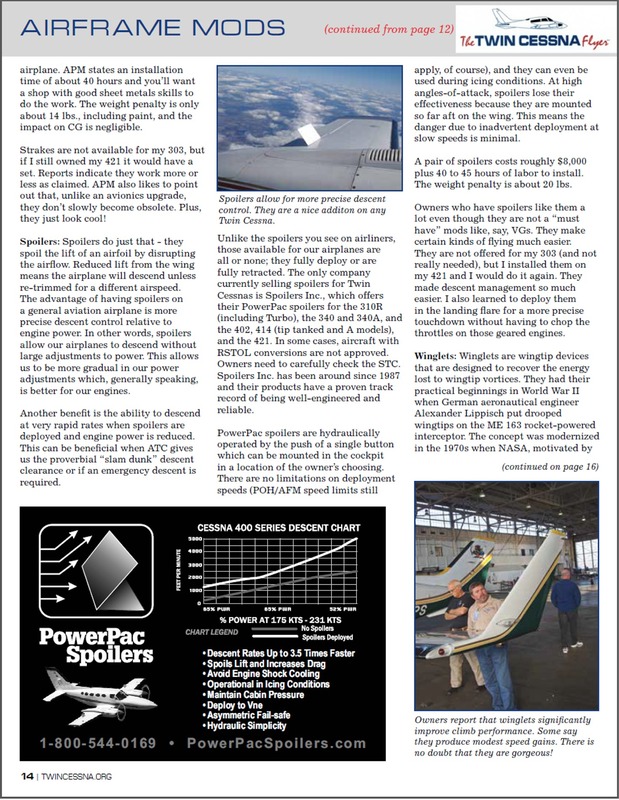 Article from Twin Cessna Flyer magazine, discussing the benefits of spoilers. 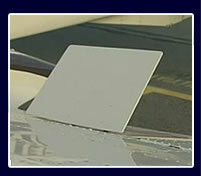 There is an STC’d PowerPac Spoiler Kit just for your Cessna 400 Series. We’ve flown many hours in your aircraft type during testing and certification. Give us a call today: 253-851-1769 or Email Us. STC: SA4913NM 3-30-90 SP4000 Cessna 402C, 402C R/STOL, 414A, 414A R/STOL, 414AW, 421C, 421CW, 421C R/STOL, 421C w/Turbine engines, 425 SA4937NM 5-11-90 SP6000 Cessna 421B (Without STOL) SA00001SE 6-9-93 SP12000 Cessna 414 (Without STOL) Uses independent, dedicated hydraulic power pack. 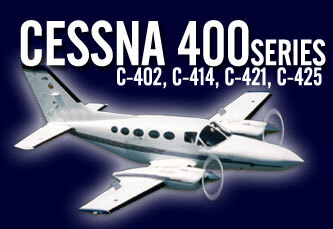 Cessna 400 Series Installation Time: 40-45 Labor hours. With Robertson STOL add 15-20 hours plus $300 parts.